Front windows squeak when closed tightly. Followed Honda repair advise to use anti-squak tape and grease the gaskets around the door. Didn't fix it. Annoying! Have the EXL model with heated, power drivers seat. Passenger seat heat is not heated on the back portion due to some airbag issue. Comfortable front seats. Good rear leg room. I wanted a car that got 30 mpg, with a sunroof, heated seats, no nav, manual transmission. 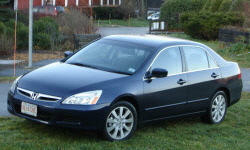 The 07 Accord EXL fit the bill. Hard to find the 4 cyl, manual, but worth it. Car bought from a dealer, but had been owned by a smoker. Used Baking Soda and water to clean the headliner and interior surfaces. Then used white vinegar mixed with water to redo interior surfaces. Used neatsfoot oil to clean the leather. Put coffee ground in car for a week. Smell gone. Squeaking Front Windows are very annoying. constant lubrication of the door gasket helps but shouldn't be necessary. Otherwise a very good car for comfort and economy and reliability.